Happy Friday! Boy this week went fast! I think it is because Monday was a holiday, so the week started a day late. Regardless of how fast the week flew by, I managed to make two French Fridays with Dorie recipes, both fishy. 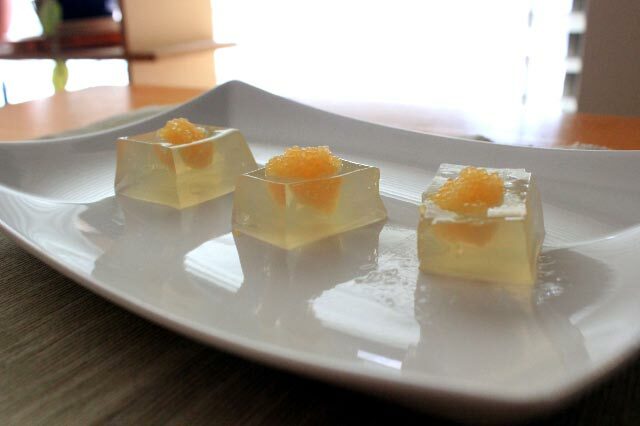 I made this week’s recipe, Spice-Crusted Tuna, and the dreaded recipe from a few weeks ago, Arman’s Caviar in Aspic. 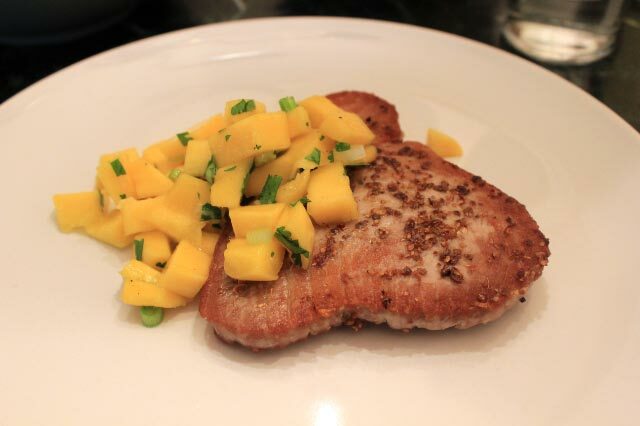 First up is a quick and easy recipe using fresh ahi tuna: Spice-Crusted Tuna. Fresh tuna is rubbed with a paste made from cardamom seeds, white peppercorns, coriander seeds, fresh ginger, and salt. Then it is quickly seared in a skillet and served with a drizzle of olive oil. I topped it with the optional Mango Chatini, found in the “Fundamentals and Flourishes” chapter of Around My French Table. The recipe called for tuna steaks that were about a half inch thick. Mine were at least an inch think, so I sliced them in half. I wish I had not done this as I ended up overcooking my tuna. The recipe stated that the inside of the steaks should remain pink, but mine were cooked all the way through. I liked this recipe, but it would have been better if I had not overcooked my tuna. This is a good quick and easy recipe to make if you are looking for something meaty, but a little different. Needless to say I had to make this one for myself. No one else in my household would touch this one with a ten foot pole. I’m still glad I made this and tried it! It’s part of the FFWD experience. Next week we get a (short) reprieve from fish. Stay tuned! I’m a little jealous. As I am writing this, my parents are actually in Paris, eating French food and pastries, and enjoying the sights and sounds of the city. I have to console myself by participating in French Fridays with Dorie. As you may have noticed, today isn’t actually Friday. I’m running almost a week behind. Better late than never! I have two recipes to tell you about: Tuna and Mango Ceviche and Tuna Confit with Black Olive Tapenade and Tomato Salsa. The group has done two tuna recipes lately, and I decided to do them both in the same week. Ceviche is a dish made of raw fish marinated in citrus juice to “cook” it. This version is inspired by the cuisine of Senegal, which was once a colony of France. The main ingredients are mango, avocado, red onion, and sushi-grade tuna. They are seasoned with red onion and ginger, and marinated in lime juice, olive oil and rum. I really liked the flavors in this dish, but they made me wish I were sitting outdoors in a tropical location, soaking up the sun! I think it was the lime and mango that did it. Tuna Confit. Tuna submerged in olive oil and aromatics for a long marinade, then cooked slowly in the marinade. The aromatics include preserved lemon (I made my own! ), sun-dried tomatoes, garlic, white onion, celery, parsley, thyme, rosemary, red pepper flakes, and lemon juice. After the tuna is cooked, Dorie has us serve it with a tomato salsa and a dollop of olive tapenade. I decided to try her olive tapenade recipe and it was easy and delicious! I served it all on a bed of mashed potatoes. I used a lot of vegetables from the garden for this meal! Cherry tomatoes, rosemary, potatoes, and even the sun-dried tomatoes. Yummy, comforting meal! I liked this one a lot. It was a lot of fun to try, and it was great to make use of some of the garden veggies. This post participates in French Fridays with Dorie, an online group cooking our way through Dorie Greenspan’s book Around My French Table. We don’t share recipes, but I encourage you to get the book. For those of you keeping track, I only have 4 make-up recipes to go! I can do it! I spent the day pulling molding off the walls in one of our bedrooms; the baseboards and the molding around the door. Other than the rug burns on my knees, I enjoyed the process. It felt good to pull out the old to prepare for the new. Oh, the possibilities! This was a good week for a simple French Fridays with Dorie selection. We made an appetizer called Tuna Rillettes. According to The Food Lover’s Companion, rilettes is a pâté-like spread usually made from pork or other meats, including fish. I had a wonderful pork rillettes recently at Campo here in Reno. Tuna Rillettes couldn’t be easier to make. Chunk light tuna, sliced shallot, curry powder, a pinch of allspice, crème fraîche, and salt and pepper are placed in a small food processor and whirred until it is fully blended and becomes a nice spread. After a rest in the refrigerator, spread on crackers and enjoy! Yum, this was good! I enjoyed it as an appetizer one day and for lunch the next. The subtle curry flavor was delicious. I did an experiment on my husband: I asked him to guess the main ingredient. He couldn’t figure it out, but did enjoy the rillettes very much. This week’s French Fridays with Dorie recipe couldn’t have been more perfectly timed. We have had a glut of tomatoes from the garden, and while they are wonderful, I am getting tired of cooking “summer tomato” recipes and am really ready to start cooking more comforting autumn meals. Salad Niçoise was the perfect bridge because I could still use up some tomatoes, but in a different way than I have been. I also got to use green beans and potatoes from the garden! Funny story about the potatoes: We were out in the vegetable garden on Saturday. I noticed that something had been doing some serious digging in my raised bed (no damage, fortunately). Suddenly we noticed a potato sitting on the ground. Then more potatoes, just sitting there out in the open. That something (I suspect a raccoon) dug up several potatoes and just left them untouched on top of the soil. No scratches, or bites, or any kind of damage (whew!). In fact, there were just enough potatoes dug up for this recipe. We really enjoyed this salad. The variety of flavors and textures all go so well together. What a wonderful way to enjoy the Fall harvest! You can find the recipe for this version of Salade Niçoise in Dorie Greenspan’s book, Around My French Table. Is it really Friday already? This week has sure flown by, but at least I found time to cook and blog about this tasty meal. It’s a two-fer French Fridays with Dorie this week: I made this week’s Tuna-Packed Piquillo Peppers and a make-up from earlier this summer, Socca from Vieux Nice. I have been looking forward to making the Tuna-Packed Piquillo Peppers forever! I even bought some of the ingredients (the piquillo peppers and imported tuna) a while back on vacation in anticipation of making this dish. I liked the olive oil-based tuna salad filling a lot. It was very flavorful, and much lighter than a mayo-based tuna. The bright flavors came from lemon zest, capers, shallot, olives, parsley, and lemon juice. Stuffed in the piquillo peppers, it made a tasty “small plate”. Socca is a popular street food from Nice. It is a crepe-like pancake made from chickpea flour. It was very easy to make: Mix the chickpea flour with water, olive oil, salt, and fresh rosemary, and let it rest for at least 2 hours. Pour the mixture into a hot, oiled pan and bake at a high temperature for just a few minutes. This one was fun to try and we liked it! I made half the recipe, which was the perfect amount for our dinner. I especially liked the crispy edges that got soaked in olive oil. Yum! I served the stuffed peppers and socca with an heirloom tomato caprese salad and steamed Romano beans. A lovely “Mediterranean-inspired” meal! The participants of French Fridays with Dorie do not share recipes, but you can find them in Dorie Greenspan’s wonderful book, Around My French Table. I highly encourage you to check it out! I hope all my U.S. readers had a fun Fourth of July yesterday! Perhaps you took today off too and enjoyed a long weekend. Yesterday we took a drive past a very busy Lake Tahoe and went instead to a much less busy (though busier than usual) Spooner Lake for a picnic lunch and a walk. I wrote about Spooner Lake last year. I will be telling you about two French Fridays with Dorie dishes today: Wheat Berry and Tuna Salad, and Sablé Breton Galette with Berries. Wheat Berry and Tuna Salad was the perfect dinner for this hot week we’ve been having. The wheat berries and hard-boiled eggs were cooked early in the day, and the rest was just assembly. I don’t believe I have eaten cooked wheat berries before (though I already had some for making sprouted wheat bread). I liked their chewy texture. The wheat berries were tossed with a simple vinaigrette, celery, onion, red pepper, red apple, and albacore tuna. The salad was placed on a bed of mixed greens, then topped with grape tomatoes, avocado, and hard-boiled eggs. I really liked this salad! The flavor combination was great. My husband said he liked everything but the wheat berries. He also declared his love for hard-boiled eggs and said if I made a batch of them every week he would eat them for breakfasts and snacks. In fact, he has brought up the idea of hard-boiled eggs (and also gone so far as to suggest deviled eggs) every day since we ate this salad, so I see more hard-boiled eggs in our future. I made Sablé Breton Galette with Berries last week on my birthday. What makes this galette special is the crust. Instead of a typical tart crust, this is a soft cookie-like crust inspired by the buttery sablé cookie from the Brittany region of France. I made four small galettes (galettelettes?) instead of one large. They were topped with homemade lemon curd (from the recipe given in the book) and blueberries. Heavenly! The French Fridays with Dorie group does not share recipes, but Dorie herself shared the recipe for this galette in her newsletter. If you do not own a copy of Around My French Table (why not? ), you can find the recipe here. I seem to be on a every-other-week schedule lately. I read somewhere a while back (I think it was on Simple Mom) about the “seasons” that occur when running a home-based business, especially if you have kids. Some seasons you have a lot of time to devote to your business and other seasons you don’t. Accepting the reality of the seasons and even preparing for them can help ease the pain of not having the time you wish you had. The seasons can apply to a personal blog too, and I seem to be in an “off-season” right now. And I’m OK with it. I cooked two French Fridays with Dorie recipes this week (poor planning and a trip out of town caused last week’s to go unmade): Lentil, Lemon, and Tuna Salad and Olive Oil Ice Cream. The Lentil, Lemon, and Tuna Salad was unlike anything I had made before. Lentils du Puy (French green lentils) are cooked and then combined with a mustard-olive tapenade vinaigrette, a preserved lemon, green onions, and canned tuna. After a rest in the refrigerator to blend the flavors, the salad is served. I served mine on a bed of mixed greens with sliced tomatoes adorning the sides. I really liked this salad. I loved the piquant flavors of the dressing mixed with the lentils and tuna. Leftovers for lunch were quite tasty. My husband was more neutral about this one. While he didn’t mind it, he won’t be requesting it for future meals. Quite intriguing was the Olive Oil Ice Cream. It is a basic custard-based vanilla ice cream, except some of the cream is replaced with olive oil. Dorie suggests tasting the olive oil before using it to make sure it doesn’t have a peppery finish. I’m so glad she suggested this, because the oil I had planned on using did have a peppery finish. I served this over two nights, two different ways. I wanted to us to experience the ice cream fully. The first night I served the ice cream plain, with just a drizzle of olive oil and a light sprinkling of grey sea salt. I asked my husband to guess the flavor. He couldn’t guess, but you can clearly taste the olive oil when you know it’s there. The flavor was interesting (in a good way!) but we decided we would rather have plain vanilla or another flavor all-together for eating it plain. The next night I served the ice cream drizzled in chocolate sauce and topped with a sprinkling of grey sea salt. The flavors were fantastic together! Dorie wasn’t kidding when she said the ice cream is “spectacularly good” with chocolate. We both thoroughly enjoyed it and my husband was hoping for more the next night. My conclusion with the ice cream is that I will make it again if I am serving it with something that it will go well with, but for “just eating”, I will stick to other flavors. It was very fun to try!